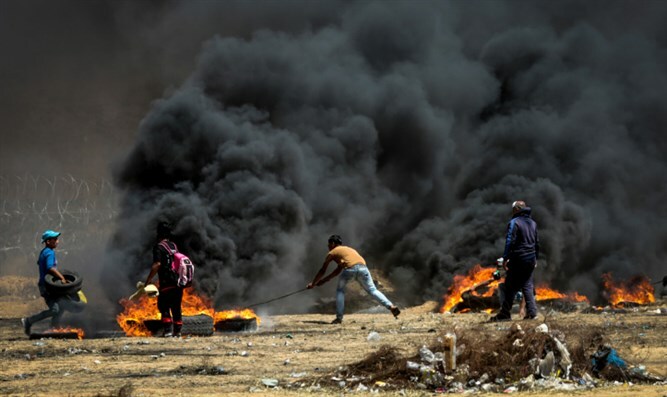 Thousands of rioters gather along Gaza security fence, burn tires and attempt to damage security infrastructure. Thousands of rioters gathered in five locations along the Gaza security fence on Friday afternoon. The rioters burned tires next to the security fence and attempted to damage security infrastructure. The IDF said its troops responded with riot dispersal means and operated in accordance with the rules of engagement. During the violent riots, an IDF vehicle was fired upon and a suspect was identified crossing the security fence in northern Gaza and planting a grenade which exploded as he returned to the Strip. No IDF injuries were reported. “The IDF is prepared to continue operating against attempts to attack and damage security infrastructure,” said the IDF Spokesperson’s Unit in a statement. Arabs have hurled rocks, firebombs, and flaming tires at Israeli soldiers securing the border and have used makeshift “terror kites” to drop explosives on Israeli positions during the violent riots, dubbed “the March of the Return”, which began on March 30. The riots have been openly encouraged by Hamas as well as by PA chairman Mahmoud Abbas. The organizers of the riots have announced that they will intensify them on Tuesday to mark the anniversary of the Arab defeat in the Six Day War in early June of 1967.